I saw this fabric at Jo-Ann Fabric and I couldn't say no. It is perfect for making a merman tail, or an aquatic dragon. 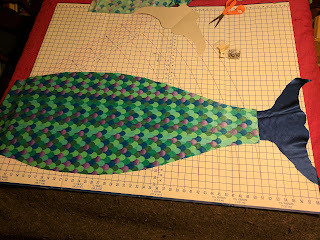 So last night after Quinn went to bed I taped a few of his drawing papers together and cut out a mermaid tail pattern. 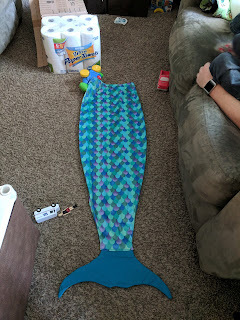 I cut out one side of the mermaid tail, just to get it started. Today I went back out to Jo-Ann's and swapped out the fabric for the tail, picked up some stiff interfacing to use for the fin, and started to sew. Quinn hung out a little bit, although he was more interested in other things since he couldn't help me cut. 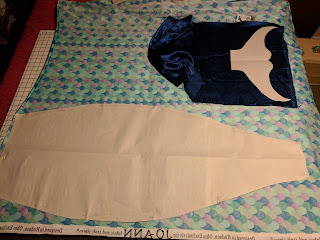 But finally this afternoon I was done sewing. Its very large (20" wide by 45" long just for the body), but I figure that's more than enough room for him to grow into it. 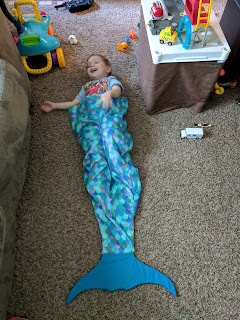 Right now he can use it as a sleeping bag merman tail.